1. Tell us something about Fond du Lac or the Lake Winnebago Region that no one knows about or something you were surprised to find out about. Miles: I was surprised to find out about the sturgeon in Lake Winnebago. A friend of mine did a project about them at our school and I would love to learn how to spear them. Mom won't take me though, so I have to watch them come off the ice during the Sturgeon Spectacular instead. 2. With so much nature in our area, what types of outdoor adventure do you participate in and where? Miles & Eleanor: In the summer, we love playing tag at Lakeside Park and riding on the zip line there. In the winter, we love playing in the snow and going sledding on the hill by UW-Fond du Lac. 3. Where would you go in Fond du Lac or the Lake Winnebago Region for your favorite beverage? What would that beverage be and why? Eleanor: Kitty cocktails at THELMA because they make them perfectly and I can drink while I dance to awesome music. 4. Where is your favorite place to have fun and why? Eleanor: I love to go roller skating at Spectrum Roller Rink. I feel like I'm gliding on air and I can use skates or roller blades and I love roller blades. Miles: I love going to Blue Line Family Ice Center to go skating and to watch hockey. I love watching the Marian hockey teams! 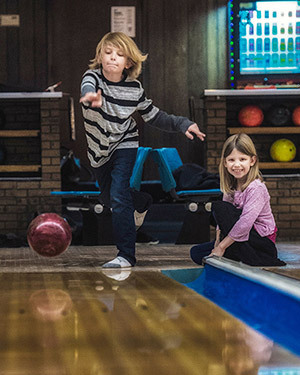 Our second favorite places are tied between Ledgeview Lanes, because it is close to our house so we can walk there and go bowling and eat pizza and Fondy Sports Park because they have trampolines, mini-golf, go karts and an arcade. 5. What is your favorite season and what is that "one thing" you absolutely have to do every year in that season? Why? Eleanor: My favorite season is winter because I know all the bees are sleeping and love sledding on the big hill at UW-Fond du Lac and building snow forts with all of our snow. Miles: My favorite season is summer because I can go to Fondy Sports Park to play and to practice baseball in the batting cages.